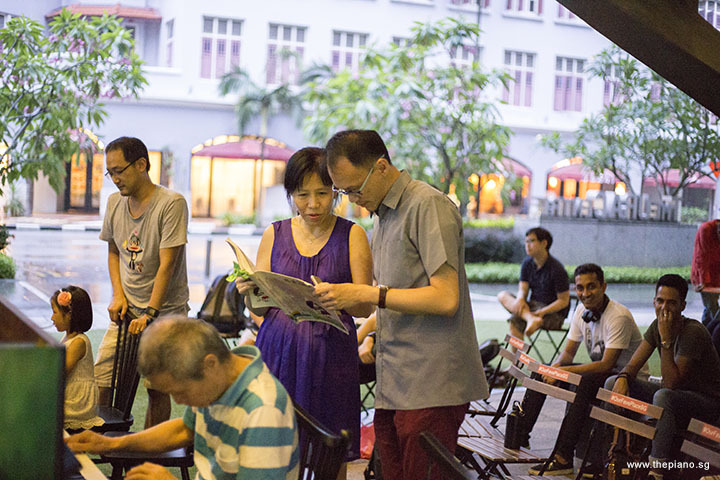 It was another Sunday evening and once again, it was time for piano lovers to gather at the URA Centre. Known as Pianovers, this group of piano enthusiasts comes together every weekend to meet, to bond and to share their love for piano. 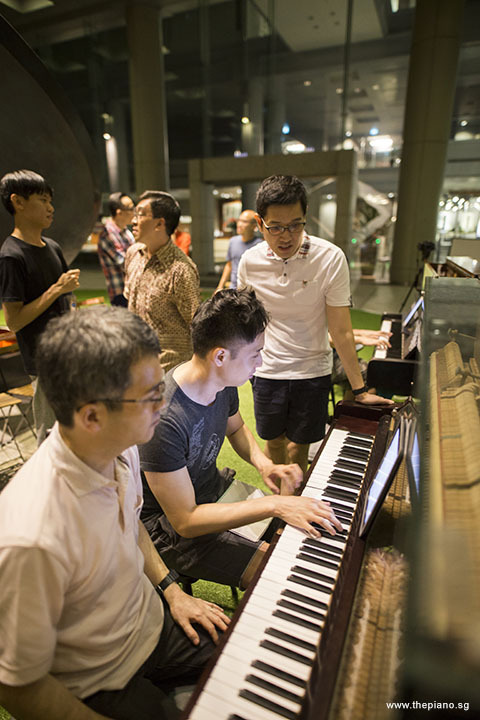 ThePiano.SG aims to build a close-knit community of Pianovers in Singapore who connects in person instead of depending on online chats. It has been organising the face-to-face meetings, known as Pianovers Meetups, for three quarters now. Each week sees not just the return of regular Pianovers but also the joining of new members. 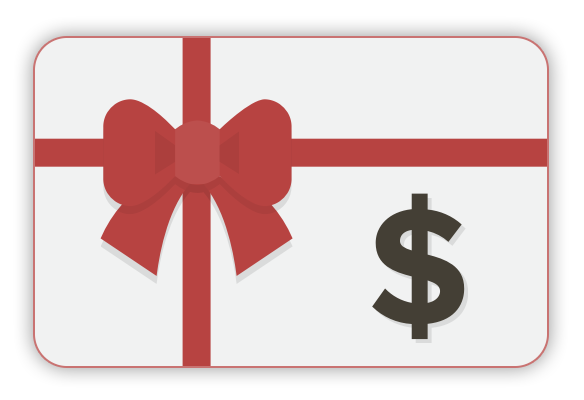 Regular members have also been bringing their families and friends, and this is something that we are certainly very happy about! Today, we had some newcomers join us. 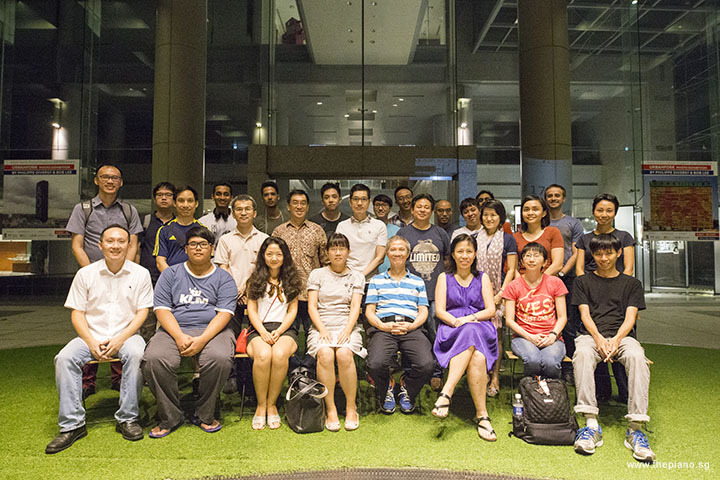 We warmly welcomed Sebastien, YY, Tiffany and Nicholas to their maiden Meetup! 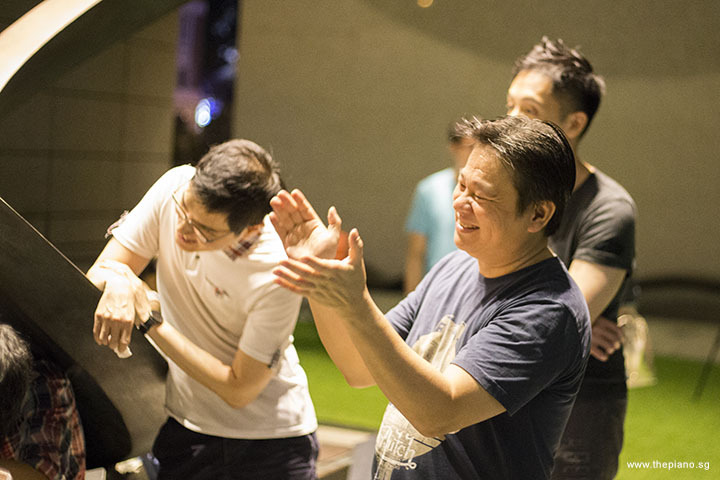 Joining the early birds was Chris Khoo, and the five of them, together with Sng Yong Meng, founder of ThePiano.SG, set off for the Maxwell Food Centre for dinner. It is worth noting that even Nicholas joined us for the first time, he was to play a piece later in the evening. Chris, being a regular, also gladly performed for us! After dinner was over, the group of Pianovers headed back for URA Centre, where the two upright pianos were waiting for them. 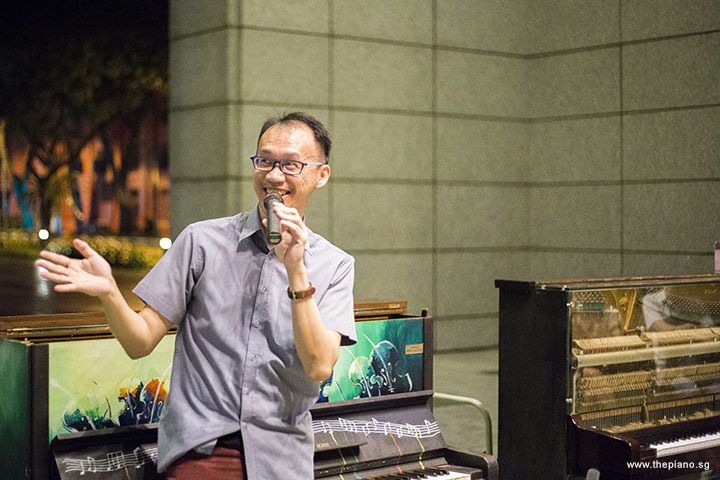 These pianos were left there as part of Play It Forward, a community project by three former NUS Piano Ensemble members. Now, we found more newcomers joining us. Novita was here for the first time, and she brought along her family, namely her husband Thomas, and their girl, Gwen. We also welcomed Nitin, who came for the first time. Nitin was brought by Jeremy, who had attended Pianovers Meetup previously. Also here for the first time were Chantra and Sher Maine, as well as a couple, Ian and Madeline, who brought their son, Asher. Pianovers were to realise later in the evening that even though Gwen and Asher were here for their first time, and they were children, they gamely performed for the audience! Needless to say, the Pianovers Meetup would not be complete without the presence of the regulars, who have not failed to come weekly. This Sunday evening saw Albert, Siew Tin, May Ling, William, Jin Li, Isao and Zafri, all of whom played this evening. Joining us this evening were Gerald and Wenqing, Gee Yong, Julia, John, Jimmy, Brian and Joseph. We had a great turnout tonight and Pianovers Meetup #37 got off to a great start with its first segment, the Mini-Recital! Gwen started the Mini-Recital with Waltzing Matilda, a very famous ballad in Australia, which was composed by Christina Macpherson in 1895 and is also the unofficial national anthem. More than that, it even earned the title of having the most recordings than any other Australian song. Next was Isao who affectionately announced that he was back to “revenge” Asuka's Theme that he performed earlier in Meetup #33. Written by Michiru Oshima, Asuka is the 61st NHK Asadora Drama that tells the story of one young girl's dream to one day walk in her father's shoes and become a top candy maker in the male-dominated world of wagashi (Japanese confectionery). 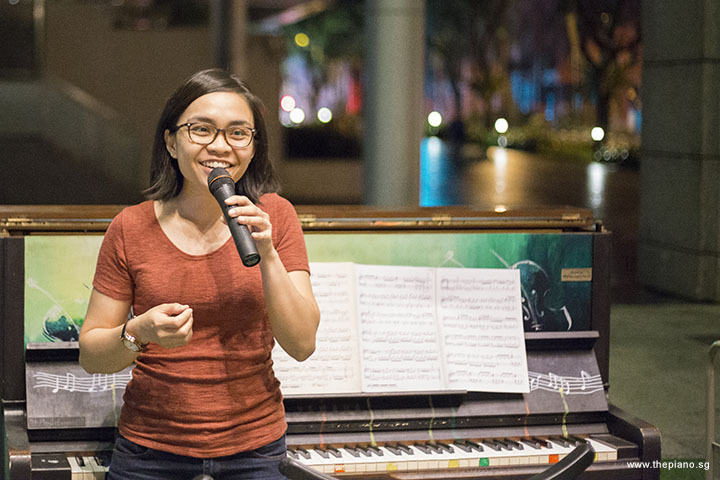 Siew Tin has been performing in almost every Meetup ever since she joined us at #16, and today she prepared 想思河畔, a traditional Thai piece, recorded by many artists, including 梅艳芳 (Anita Mui). We started to clap our hands to the tune of Chan Mali Chan, and silently added "Oi, Oi!" as Chris brought us a medley of familiar Malay folk songs, including such favourites as Rasa Sayang and Burong Kakak Tua. Such fun we all had! Albert delivered "我有一段情" by 梅翁, and "Dreaming of Home and Mother" by John Pond Ordway. The latter is actually an 1851 popular sentimental song of the Civil War era, and has been translated into Japanese and Chinese versions (送别). Returning Teik Lee introduced us to "Byul (Star)" from the 2006 Korean movie "200 Pounds Beauty" which was based on "Kanna's Big Success", Japanese manga, that tells the story of an overweight ghost singer who aspires to be a pop sensation through intensive plastic surgery. Teik Lee also performed the 1967 single "Can't Take My Eyes Off You" written by Bob Crewe, and Bob Gaudio. Jin Li played tonight's first classical pieces - "Sonata in A, K. 209" by Scarlatti, and "Waltz in D-flat major, Op. 64, No. 1 (Minute Waltz)" by Chopin! Seeing her finger-works on the keyboard reminds us that, typically, classical pieces are technically more demanding. May Ling surprised us next with her choice - "I Do" by Korean singer Rain, who scored his second big hit in Asia with this single, after the huge success of "It's Raining". William continued the Korean fever with "I Believe" and "Love and Longing" from the 2001 Korean movie "My Sassy Girl". An interesting observation was the rise in the popularity of the baroque piece "Canon in D", which was used in a romantic scene where the lead male actor was disguised as a food delivery person and entered a crowded auditorium, watched the Girl play George Winston's Variations on Pachelbel's Canon in D on the piano, and presented her with a rose after she finished playing. The encounter culminated in the couple hugging each other. Newcomer Nicholas intrigued us with his original composition "kinderpieces". As part of the performance, he added "gasps" and spiced things up with intentionally-planned minor acting. 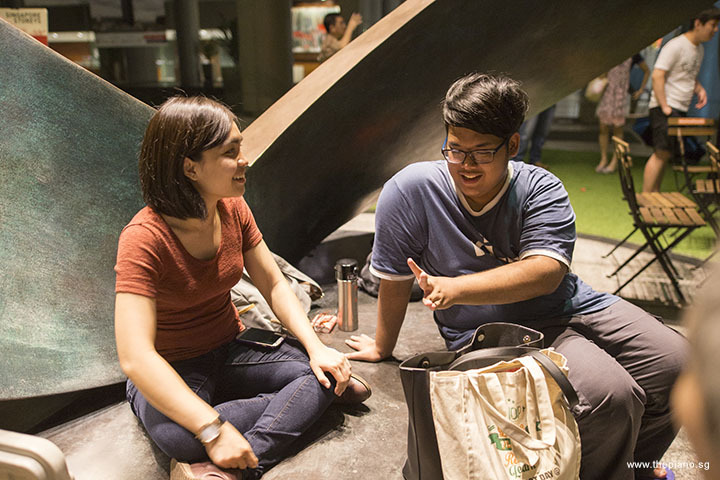 He had the audience drawn into what seemed like a musical right there – A first in our Meetup! Another newcomer Asher, an 8 year-old boy, astonished us with two demanding numbers, "La Folia (Theme and Variations)", and "Tarantella" by Albert Pieczonka; and won the deserving applause from the floor. His dad, Ian, followed up with Yiruma's "River Flows in You". The Mini-Recital was concluded with Zafri's performance of "The Reluctant Heroes" by Hiroyuki Sawano used in the Japanese manga "Attack on Titan". He also shared with us how the Meetup had been very inspiring to him and motivated him to practise more so that he could finally perform for us. Unknown to us before his sharing, Zafri had taken several months to learn this piece. All of us Pianovers present could see his efforts; his hard work did not go to waste! Following the Mini-Recital, Pianovers proceeded with the Open Segment, during which Pianovers jam on the two available pianos. 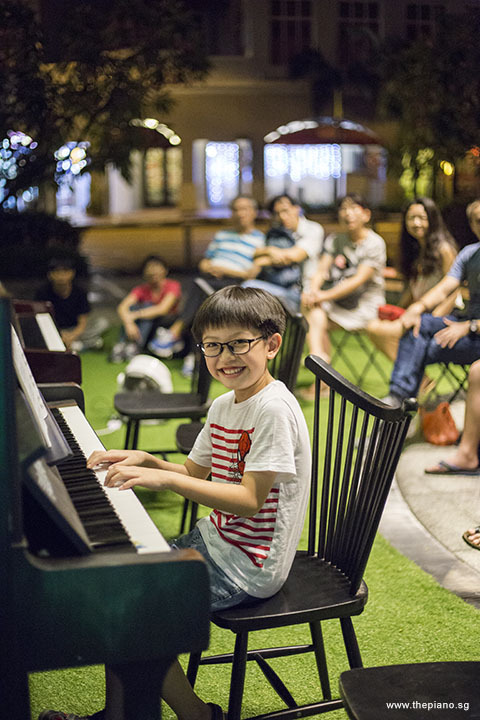 This is a weekly, informal segment in which Pianovers watch the performers play with no set sequence and are free to interact with the performers. 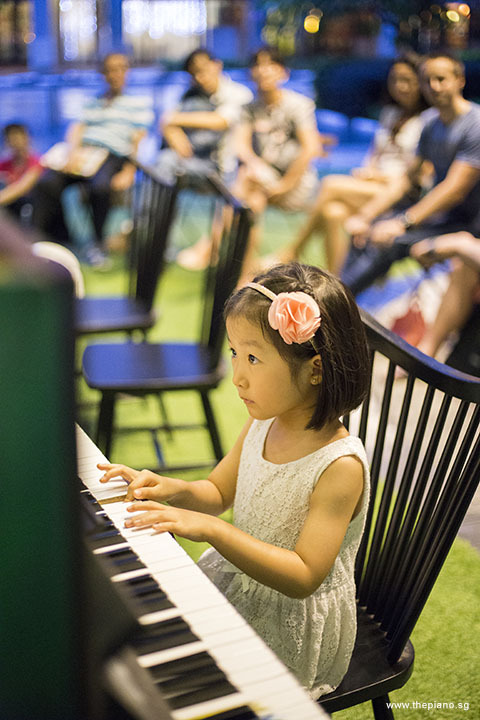 There is no preset sequence and Pianovers are free to watch the performers play and even interact with them. Pianovers also take the opportunity to share what they know about piano with fellow attendees. It is customary for the Pianovers to take a group photograph every Meetup session. As the clock struck nine, the lights at the URA Centre were switched off, however, for some of us, time was never enough, and we continued to play even in the dark. Through another evening of performing and sharing, the Pianovers had forged an even stronger bond between one another. 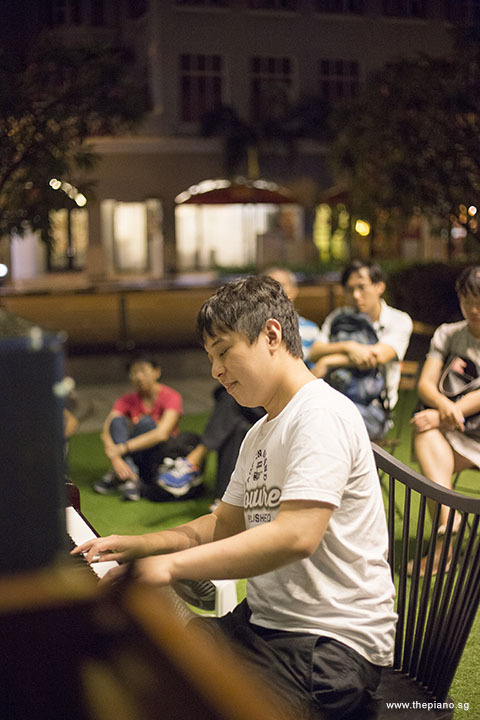 Do join us during Pianovers Meetup #38!